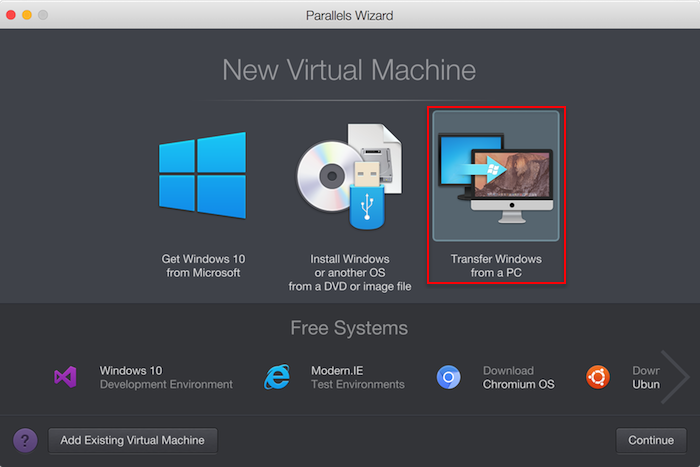 I want to migrate my Windows PC along with all its content to a Parallels Desktop virtual machine. 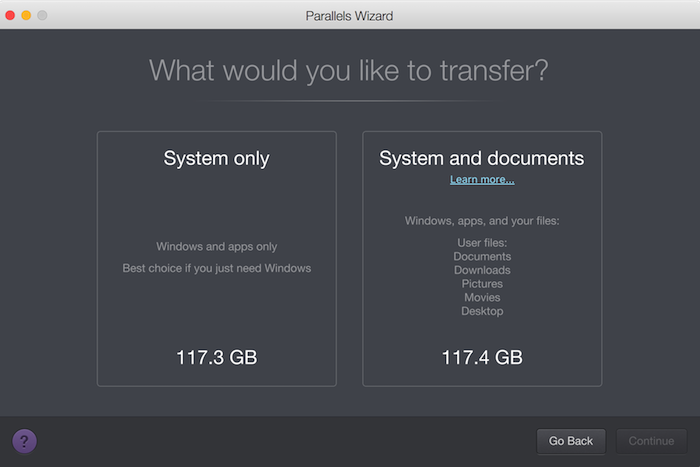 Parallels Desktop 13 for Mac offers the user a PC migration experience that is faster, more stable, fast and much easier to follow. This KB article briefly describes the migration process. For the detailed instructions, please refer to the Parallels Transporter Agent User's Guide. NOTE: Parallels Desktop does not support migrating Windows dynamic volumes (in which the size is not fixed, as it is in basic volumes). They are migrated as data disks only. You can add them later to an existing virtual machine. IMPORTANT: OEM Windows operating systems may not work with Parallels Desktop after you migrate them to virtual machines. OEM operating systems are only distributed when they are sold with computers. The best example of an OEM operating system is the copy of Windows that comes pre-installed when you buy a new PC. After importing your data from your PC, you may need to reactivate some of your Windows programs using the activation keys you received when you purchased the programs. 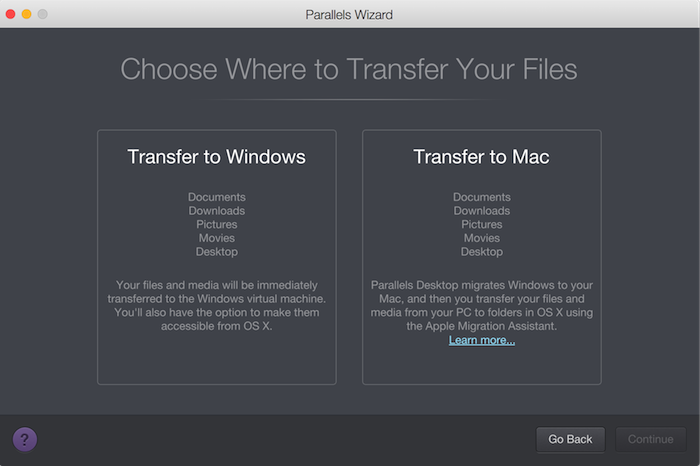 Download the Parallels Transporter Agent for Windows and double-click the installation file. Follow the installation procedure and run the Parallels Transporter Agent. Choose the desired method for importing your data from your PC to your Mac. Turn on both your Mac and Windows PC. Make sure that the computers are connected over the same network. Make sure that the Windows firewall is turned off. You can turn it on again after the import is finished. On your Windows PC, open the Parallels Transporter Agent. Select Transfer Windows from a PC and click Continue. Select Network and click Continue. Find the passcode displayed in the Parallels Wizard on your Mac and enter it in the Parallels Transporter Agent on your Windows PC. You can also connect to the source Windows PC using its name or IP address: click Connect using IP address, select the Windows PC name from the list or type the IP address, and click Continue. If you have chosen to use the computer name or IP address, provide the Windows administrator credentials. 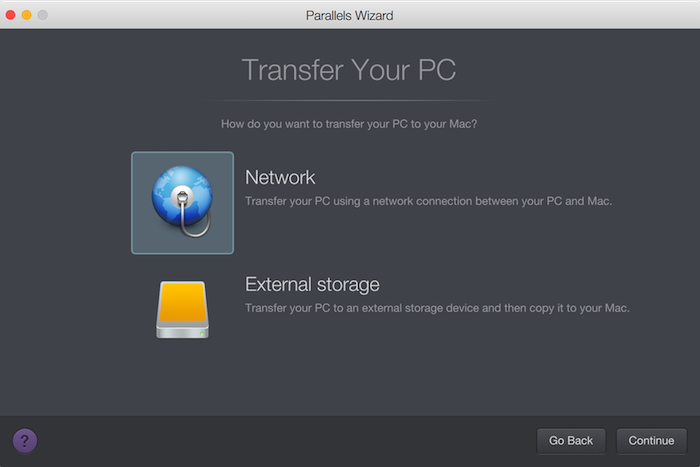 Parallels Desktop will connect to the Parallels Transporter Agent and start collecting information about the source computer. If you don't want to log in to Windows automatically whenever you start up, select Do not enable Automatic Logon. Then click Continue. Choose whether you want to migrate all your files and data or only Windows applications. Then click Continue. Choose where you want to install your data. In the next step, you will see a warning about the Windows reactivation that might be required when you start using it. To proceed, read this message, select I want to continue, and click Continue. Follow the migration process. Note that the migration duration depends on the amount of data which needs to be transferred from PC to Mac. Once the migration is complete, click Done. When Windows boots up, click on the Actions menu > Install Parallels Tools and follow the onscreen instructions. NOTE: To be able to install Parallels Tools, you must be logged in to Windows as an administrator. Connect an external storage device to your Windows PC. 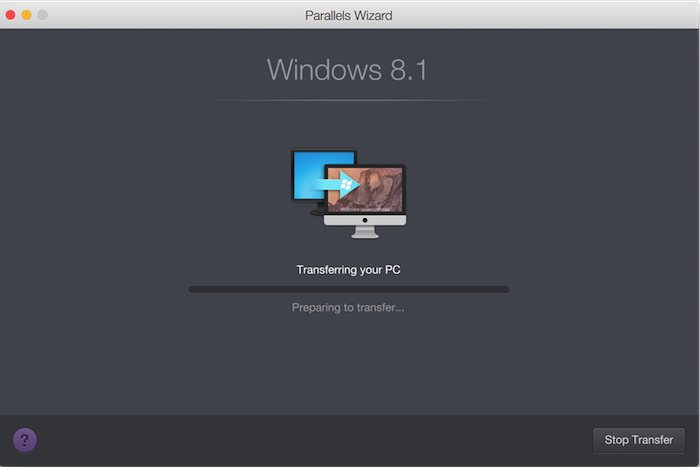 In the Windows PC, open the Parallels Transporter Agent. Choose the External storage migration method. Click Next. 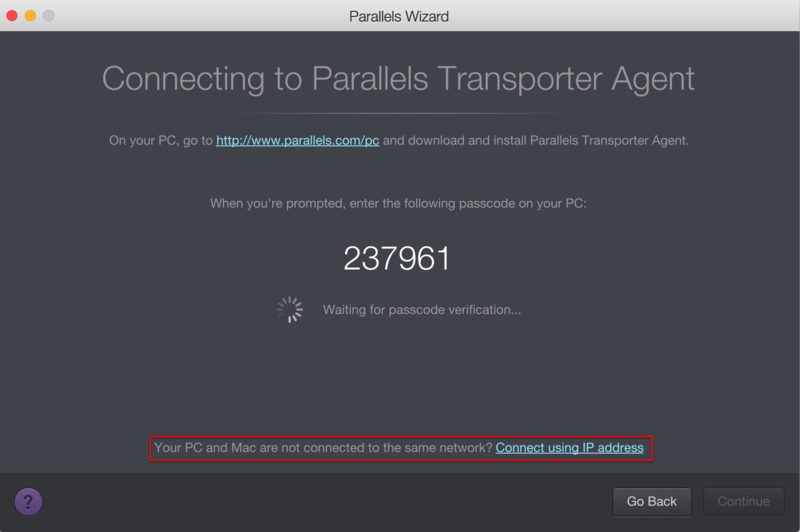 The Parallels Transporter Agent will collect information about the Windows PC. If you don't want to log in to Windows automatically whenever you start up, select Do not enable Automatic Logon. Then click Next. Choose whether you want to migrate all your files and data or only Windows applications. Then click Next. In the next step, you will see a warning about the Windows reactivation that might be required when you start using it. To proceed, read this message, select I want to continue, and click Next. 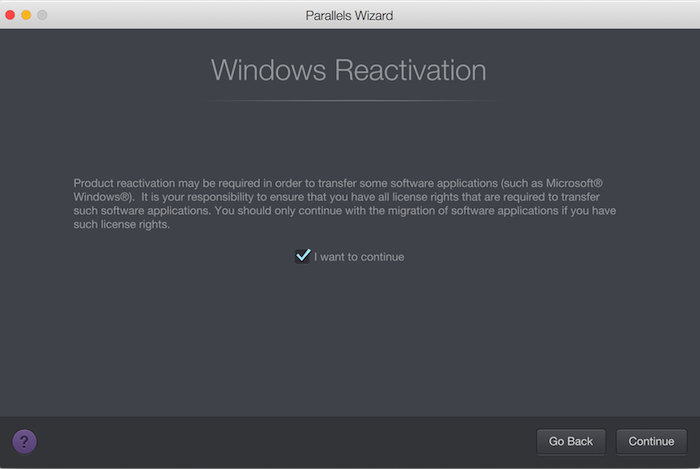 Once the migration is complete, click Done to quit the Parallels Transporter Agent. Disconnect the storage device from the Windows PC and connect it to your Mac. On your Mac, open Parallels Desktop and choose File > New. Select Migrate from a PC and click Continue. Select External Storage Device and click Continue. Click Choose and locate where you chose to store your data. Then click Continue. Choose where you want to install Windows and your data, then click Continue. When Windows boots up, choose Actions > Install Parallels Tools and follow the onscreen instructions.